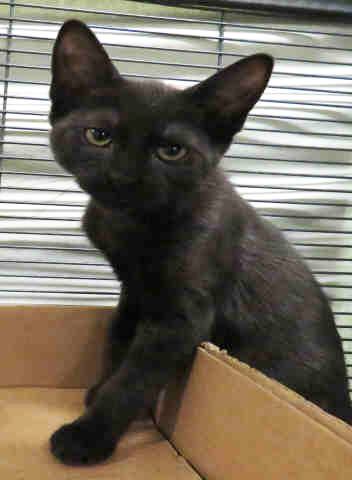 Dec. 20, 2017 – The Ottawa Humane Society is asking that a four-month-old black kitten in need of medical attention be returned to the shelter. The kitten was taken on Dec. 16 between 1 and 5 p.m. The kitten, named Briana, was receiving antibiotics and eye ointment to treat an upper respiratory infection when she was taken. She was scheduled for a check up with a veterinarian on the morning of Dec. 17 to determine if she needed further treatment. “We’re asking that Briana be returned to the OHS no questions asked. She needs to be seen by a veterinarian as soon as possible,” said Bruce Roney OHS executive director. Briana was available for adoption through the Foster-Me-First Program in which animals who are almost ready for adoption, but are receiving medical treatment are fostered by the adopter for the duration of treatment. Once the animal is medically sound, the adoption is finalized. Anyone with information is asked to call the OHS confidentially at 613-725-3166 ext. 221. Dec. 13, 2017 – The extreme cold forecast for the city tonight means pets left outside too long risk frostbite and even death without shelter from the frigid weather. Ensure that edibles in Christmas stockings are unreachable by your pet. Dec. 6, 2017 – If your pet goes missing, what are the chances it will find its way home? The Ottawa Humane Society is urging pet owners to take precautions to ensure that if their dog or cat becomes lost, it has the best possible chance of a safe return — by implanting a grain-sized microchip offering permanent, life-long identification. The OHS is holding its twelfth microchip clinic of 2017 on Sunday, Dec. 10 at its 245 West Hunt Club Rd. shelter. When: Sunday, Dec. 10, from 9 a.m. to noon. 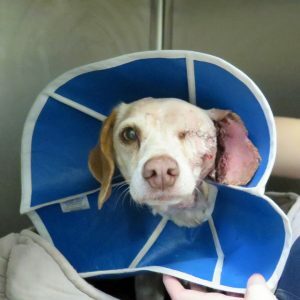 Nov. 30, 2017 – Sadie Mae, the eight-year-old beagle who arrived at the OHS earlier this month with a gunshot wound to the head, is expected to make a full recovery. Sadie Mae had surgery at the OHS on Nov. 22. A surgeon removed her left eye, which had a bullet fragment embedded in it, repaired a hole in her left ear and reconstructed the tissue on the left side of her face. She is now resting comfortably in the OHS critical care unit where she’s being treated with antibiotics and pain medication. She is also being treated for Lyme disease. “Sadie Mae is making great progress and is in very high spirits. She’s always wagging her tail to greet staff,” said Dr. Shelley Hutchings, OHS chief veterinarian. Sadie Mae will spend at least another six weeks recovering at the OHS, then she will be spayed and have dental surgery before she’s ready to find a new home. Police rushed Sadie Mae to the Ottawa Veterinary Hospital to be stabilized after a Good Samaritan found her wandering on a trail in Carp. She was transferred to the OHS on Nov. 13. It is unknown whether the shooting was a hunting accident or intentional. No owner has come forward to claim her. Celebrate the Season With the Animals and Santa Paws at the Ottawa Humane Society! Nov. 24, 2017 – Whether it’s attending Critter Christmas next Saturday or stopping by for a picture with Santa Paws, come spend some time with the animals at the Ottawa Humane Society to celebrate the season! Make it a meowy Christmas by celebrating with the OHS at the Critter Christmas party next Saturday! Join us for family activities including cookie decorating, holiday-themed crafts, OHS Auxiliary craft and bake sale, and more! When: Saturday, Dec. 2, from 11 a.m. to 1:30 p.m.
Where: Ottawa Humane Society at 245 West Hunt Club Rd. Why: To celebrate the season! Santa Pet Pics kicks off next Saturday, Dec. 2, and continues till Dec. 21. Stop by with your pet for a picture with Santa Paws and make a special holiday memory with your best furry friend. Please note, all participating animals must be in a carrier or on a leash. For more information and times, please visit www.ottawahumane.ca/santapetpics. All funds raised go to help the animals in the care of the OHS. Nov. 21, 2017 – Imagine a holiday season where you not only fulfill your children’s holiday wishes but make a homeless animal’s dreams come true too. Nov. 17, 2017 – An eight-year-old beagle is in critical condition after being found with a gunshot wound to the head on Saturday evening. Police rushed the dog to the Ottawa Veterinary Hospital to be stabilized after she was found wandering on a trail in Carp. The dog was transferred to the Ottawa Humane Society on the morning of Nov. 13. 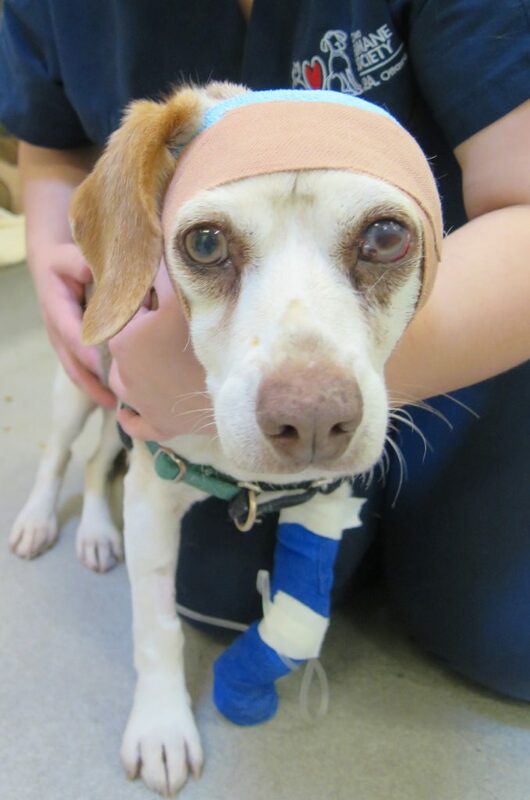 The dog, named Sadie Mae by OHS staff, has extensive injuries to her skull, left eye and left ear. She is being treated with pain medication to keep her comfortable and is also receiving antibiotics, IV fluids and daily wound cleanings and bandage changes. Sadie Mae is scheduled for extensive surgery to reconstruct her skull. It is likely that her left eye will need to be removed but vets are hoping to save her left ear. Following surgery she’ll spend at least eight weeks in the critical care unit at the OHS before being spayed and having dental work done. When she’s well enough, Sadie Mae will be ready to find a new home. “She’s a sweet and stoic dog who, with surgery and intensive treatment, has a good chance at recovery,” said Dr. Shelley Hutchings, OHS chief veterinarian. It is unknown whether the shooting was a hunting accident or intentional. No owner has come forward to claim Sadie Mae. Nov. 7, 2017 – If your pet goes missing, what are the chances it will find its way home? The Ottawa Humane Society is urging pet owners to take precautions to ensure that if their dog or cat becomes lost, it has the best possible chance of a safe return — by implanting a grain-sized microchip offering permanent, life-long identification. The OHS is holding its eleventh microchip clinic of 2017 on Sunday, Nov. 12 at its 245 West Hunt Club Rd. shelter. When: Sunday, Nov. 12, from 9 a.m. to noon. Oct. 30, 2017 – That spooky night when little fairy princesses and mini pirates holler for suckers and gummy bears can be scary and even dangerous for Fluffy and Fido. Keep cats indoors: Cats allowed to go outside may become the target of people who want to hurt them. Keep cats inside where it’s safe. Don’t take the family dog along when you’re trick-or-treating: Even friendly dogs can get spooked on Halloween and there’s a risk your dog could run off and get lost. Leave your dog at home. Use decorations with caution: Keep your pets away from lit pumpkins and electrical cords to avoid shocks and burns. Keep candy out of your pet’s reach: Chocolate can be poisonous to many animals including dogs, cats and ferrets. And don’t forget about wrappers — they can cause your pet to choke. Don’t dress your pet in a costume unless you know he/she enjoys it: Some costumes can cause stress and injury to pets, making it tough to move, hear, breathe, bark or see. Never leave costumed pets unattended. Make sure your pets are properly identified: In case your pet runs outside, make sure he or she has a collar, tag and microchip so they’ll increase their chances of being returned home. It’s a good idea to keep pets in a separate room of the house so they can’t slip out. Howl for Halloween at the Ottawa Humane Society this Saturday! Oct. 26, 2017 – Get ready to howl for Halloween at the Ottawa Humane Society’s Howl-o-ween event this Saturday! Bring the kids for crafts, treats, face painting, and more! When: Saturday, Oct. 28, from 11 a.m. to 2:30 p.m.
Oct. 10, 2017 – If your pet goes missing, what are the chances it will find its way home? The Ottawa Humane Society is urging pet owners to take precautions to ensure that if their dog or cat becomes lost, it has the best possible chance of a safe return — by implanting a grain-sized microchip offering permanent, life-long identification. The OHS is holding its tenth microchip clinic of 2017 on Sunday, Oct. 15 at its 245 West Hunt Club Rd. shelter. When: Sunday, Oct. 15, from 9 a.m. to noon. Oct. 4, 2017 – We have some news to share. There are some changes coming to the way the Ottawa Humane Society operates in our community, effective early 2018. You may recall that last year, we spoke up when the OSPCA tried to take away the voice of our community — your voice — in animal welfare by taking away our voting rights. We joined six other humane societies in court to get back your vote. The OSPCA responded by stripping our officers of their power to investigate animal cruelty. Last month, a judge dismissed our case. Obviously we don’t agree with the outcome, but for the good of the animals, we will not be pursuing an appeal but will be focusing on ensuring a better future for Ottawa’s animals. As a result, there are some changes coming to the OHS. We believe these changes will lead to better and more efficient services for Ottawa’s animals. Our first priority has always been, and will continue to be, the animals in our community. This means two things for us. The first is that we are meeting with our partners, including the City of Ottawa, to talk about options to transition the role of emergency transports, effective early next year. This significant change will be better for the animals. It will cut down on the confusion in our community we saw this past year about who to call if an animal needs emergency transportation to the OHS. It will reduce an inefficient system, so that we can focus efforts on what will do more for animals. The OHS will continue its work rescuing animals once they arrive at the shelter, with lifesaving veterinary care, food and shelter. The second change is that we will be increasing our intervention with dogs with behaviour issues, to help more of them find new homes. And, we will work more on advocacy, championing animal welfare for our community. We’ll continue to keep you updated as we move forward to become an even stronger voice for the animals in our community. Sept. 22, 2017 – Even though today is the first day of fall, the hot weather means Ottawa’s dogs are still in danger if they’re left alone in a car. The forecast is calling for temperatures hovering around the 30 C mark all weekend. Couple that with the fall season not typically being one where leaving dogs in cars is as big of a concern and you have a recipe for disaster, said Bruce Roney, OHS executive director. A dog left in a hot vehicle can quickly overheat, leading to brain damage and even death. “If you’re running and errand this weekend, leave your pet at home. Don’t take the risk. It’s a choice that could be the difference between life and death for your best friend,” Roney said. For more information please visit www.ottawahumane.ca. Sept. 20, 2017 – The Ottawa Humane Society honoured several volunteers and members of the public last night at its annual general meeting, celebrating the many dedicated and passionate individuals and organizations working together to make our community better for the animals. The Ottawa-Carleton Veterinary Emergency Hospital received the Muriel Davies Kindness Award for its outstanding contribution to animal welfare in Ottawa. Staff at the hospital regularly go above and beyond to help the OHS with sick and injured wildlife. Malcolm (Hoppy) Hopkinson received the Eleanor Prowse Volunteer Service Award for generously giving his time through volunteer work. Hoppy has been with the OHS Bingo program since August 2012, devoting many, many hours to organizing and supervising the program. Rick Powers of Snelling Paper & Sanitation received the Special Recognition Award for contributing above and beyond to the animals in the care of OHS. Rick has provided excellent customer service and has been diligent in ensuring the OHS has the supplies it needs to help the animals in its care. Julie Amyotte, a dedicated foster volunteer, was awarded the Siobhan Shefflin Memorial Award, acknowledging her devoted work providing help to many of the neediest animals that come into the care of the OHS. Julie cares for them in her home until they’re ready for adoption, giving them a second chance at a bright and healthy future. Dr. Janet Biggar and Dr. Andrea Leask were awarded the Dr. James Hutchison Animal Welfare Award for her work saving animal lives as volunteer veterinarians at the OHS. They do almost all of the rabbit sterilizations at the OHS, along with helping any other animal in need. Sept. 8, 2017 – Lace up your sneakers this weekend to help raise funds to support the nearly 10,000 animals in the care of the Ottawa Humane Society every year. Join the OHS for the 29th annual Wiggle Waggle Walk & Run presented by Escape Manor. This year, the walk and run is at Lansdowne Park. When: Saturday, Sept. 9, from 9 a.m. to 1 p.m.
All funds raised go toward helping Ottawa’s animals at the OHS. For those who can’t make it to the walk or run, consider making a gift in memory of Betsy, the former walk and run spokesdog who passed away unexpectedly this year after a brief illness. Betsy lived a life of neglect, shipped from a puppy mill in the U.S. to a backyard breeder in Canada, before she found a loving home with the funds raised by the walk and run. Aside from the hundreds of participants and their pets, there will be tons of family- and animal-oriented activities, including a K9 Fun Zone, Family Fun Zone, Pet Pavilion, and a myriad of other activities. See a detailed schedule of events at www.ottawahumane.ca/walkrun. Aug. 31, 2017 – September marks one year since two cats arrived at the Ottawa Humane Society in search of their second chances. Twelve months later, Blue and Fluffy are still waiting for someone to write the happily ever afters to their stories. It’s a milestone no cat wants to reach. Passed over by adopters in favour of other felines, Blue and Fluffy have lived vicariously through their kennel mates, peeking as happy families embrace their newest four-legged members, whisking them off in pet carriers to their new lives. They arrived separately last fall after their previous guardians could no longer care for them. Though unique in their own ways, they’re really no different than the 2,962 cats adopted from the OHS last year alone. Maybe it’s Fluffy’s age. Maybe it’s Blue’s “special needs.” For one reason or another, no one has fulfilled their simple dreams of a gentle hand to scratch behind their ears and a nice spot on a living room floor somewhere warmed by an afternoon sunbeam. To cheer up the two cats who are now going into their second September without the love of forever families to call their own, the OHS is throwing them an anniversary party this Friday, all day long. The public is cordially invited to stop by to say hi and hopefully fall in love. 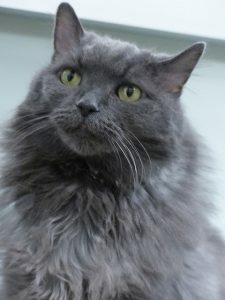 To learn more about Fluffy and Blue, please visit the cat adoption section of the OHS website or come down to 245 West Hunt Club Rd. to meet them in person — they’d welcome a friendly face to lift their spirits. Blue, who is five years old, loves to play with laser pointers and to meet new people. He is a special needs kitty, with urinary tract issues managed with a special diet, and a heart murmur that requires nothing more than monitoring. He needs an adult-only home. Fluffy, a senior girl at 10, would love nothing more than to curl up on your lap while you enjoy some Netflix. She is looking to be the only cat in a mature home. Aug. 8, 2017 – The Ottawa Humane Society urgently needs foster volunteers to help the 70 animals waiting for temporary homes to grow healthy and strong for a second chance at life. The shelter’s population is reaching a crisis level and the animals need help fast, said Bruce Roney, OHS executive director. The number of animals at the OHS will only climb as the summer continues, he said. Most of the animals waiting for foster homes are cats and dogs waiting for dental surgery, cats with respiratory infections and kittens being monitored for weight gain, he said. Summer is the busiest time at the OHS, 50 animals coming in some days — that’s up from around 20 or so a day the rest of the year. The jump in numbers means it’s harder to keep the animals healthy and to give the neediest animals the individualized attention they need to thrive. To manage the need, the OHS has scheduled a special orientation session on Aug. 15 from 6 to 7 p.m. at the OHS at 245 West Hunt Club Road. Fill out a foster application form here and return to the foster department via email at foster@ottawahumane.ca. Volunteers who meet program requirements will be contacted for a quick phone interview. Submit a criminal record check. Attend the foster orientation on Aug. 15. Most attendees will be able to take their foster animal home that evening! Aug. 8, 2017 – If your pet goes missing, what are the chances it will find its way home? The Ottawa Humane Society is urging pet owners to take precautions to ensure that if their dog or cat becomes lost, it has the best possible chance of a safe return — by implanting a grain-sized microchip offering permanent, life-long identification. The OHS is holding its eighth microchip clinic of 2017 on Sunday, Aug. 13 at its 245 West Hunt Club Rd. shelter. When: Sunday, Aug. 13, from 9 a.m. to noon. Aug. 2, 2017 – The soggy but warm temperatures forecast for this long weekend means serious danger for pets left to swelter in cars — even for just a few minutes, says the OHS executive director. “If you’re running an errand this long weekend, leave your pet at home. Don’t take the risk. It’s a choice that could be the difference between life and death for your best friend,” Roney said. If you see an animal alone in a car with the owner nowhere in sight, call the police at 911. Meanwhile, the long weekend means the OHS will be closed Monday. The public is encouraged to plan their visit to the OHS for Saturday or Sunday. July 12, 2017 – The hot weather forecast for Ottawa this week poses a great risk to pets left alone in cars, says the Ottawa Humane Society’s executive director. With the humidity, temperatures are expected to feel like 25 C and higher all week. This heat makes it crucial people never leave their pets alone in a hot car, Roney said, adding that a dog left in a sweltering vehicle can quickly overheat, leading to brain damage and even death. For more information, please visit the OHS website at http://www.ottawahumane.ca/your-pet/animal-tips/dogs-die-in-hot-cars/. 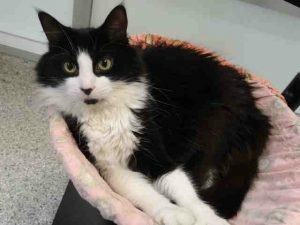 July 4, 2017 – The Ottawa Humane Society has just expanded its adoption program to include cats with the FIV virus, helping even more of the animals in our community get their second chance. The time is right for this change, Roney said. “We think our community is ready for this. We’ve done the research and recognize it’s time to make this change,” he said. FIV stands for feline immunodeficiency virus, said Dr. Shelley Hutchings, OHS chief veterinarian. Only cats can get FIV, as the virus does not infect other species of animals or humans, she said. “For us, adopting out these cats means more resources, like medical tests and our time, because we know it will take a little longer for them to find a permanent home. But to the right adopter, it’s just a member of their family in need of a little more TLC,” Hutchings said. With proper care, FIV-positive cats may live a long and healthy life, she said. They do need a little more care than a cat without the virus, she said. The most common way FIV is spread is through bite wounds. Because of this, FIV-positive cats at the OHS are only adopted into homes with no other cats, Hutchings said. “We think these cats deserve the same chance as every other feline in our Adoption Centre. These creatures will make loving companions to some lucky adopters,” Hutchings said. To learn more about the program, please visit the Ottawa Humane Society at 245 West Hunt Club Rd. June 30, 2017 – The Ottawa Humane Society is in urgent need of adopters, foster volunteers, and donations to manage a sudden spike in its animal population in advance of the long weekend. Canada Day is always the shelter’s busiest day of the year, with dozens of lost pets spooked by Canada Day fireworks expected to wind up at the OHS, straining its resources even more. The shelter’s animal population is reaching a critical level, with more than 600 animals in its care right now. There are 36 animals waiting for a foster placement right now. Finding permanent homes for 117 cats, dogs and small animals available for adoption from the OHS and its Pet Adoption Location partners would alleviate some of the pressure, Roney said. “If you’ve been thinking about it, now’s a perfect time to adopt from us,” he said. Roney said the high population means increased costs for everything medicine to food for the animals. Summer is the time when costs are at their highest and donations at their lowest, he said. For information on how to adopt, foster or donate, please visit the Ottawa Humane Society website at www.ottawahumane.ca. July 4, 2017 – If your pet goes missing, what are the chances it will find its way home? The Ottawa Humane Society is urging pet owners to take precautions to ensure that if their dog or cat becomes lost, it has the best possible chance of a safe return — by implanting a grain-sized microchip offering permanent, life-long identification. The OHS is holding its seventh microchip clinic of 2017 on Sunday, July 9 at its 245 West Hunt Club Rd. shelter. When: Sunday, July 9, from 9 a.m. to noon. 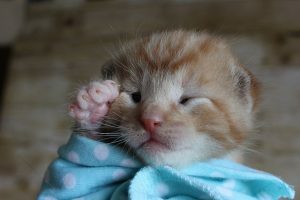 The Ottawa Humane Society is Throwing a Kitten Shower This Sunday and Everyone’s Invited! June 23, 2017 — The Ottawa Humane Society cordially invites you to celebrate the arrival of our newest bundles of joy this Sunday! We’re expecting the pitter-patter of 3,200 tiny paws in our shelter by the end of summer, leaving us with 800 new little ones to care for. To celebrate their arrival, join us for traditional baby shower games and some kitten-themed treats for purchase. We’re asking attendees to honour the newest arrivals with items from our Wish List, including receiving blankets and cat nip. When: Sunday, June 25 from 11 a.m. to 2 p.m.
For more information and to help, please visit www.ottawahumane.ca. June 15, 2017 — Johnny the kitten is really no different than the roughly 799 other baby cats the Ottawa Humane Society expects to see this season. Sure, he has a tiny thumb attached to each paw making him a polydactyl, the technical term for extra toes. 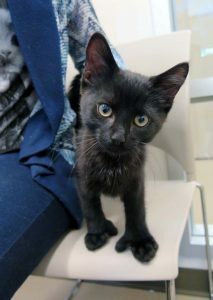 But like all kittens at the OHS, Johnny will need loving care and medical attention until he’s ready for a new family. It’s kitten season — that time of year when pregnant female cats give birth, stretching OHS resources to their max. There will be hundreds of teeny mouths to feed, spay or neuter surgeries to schedule, foster homes to arrange, health checks and vaccines to administer, and finally forever homes to procure. The OHS is seeking foster volunteers, donations and homes to give these kittens the fighting chance at life they deserve. So far in 2017, the OHS has cared for a total of 519 kittens. Some kittens have already grown big and strong enough for the Adoption Centre but many more — some orphaned and needing specialized care — have just arrived at the OHS, with dozens upon dozens more expected by the time fall rolls around. June 12, 2017 – It’s as predictable as the change in season: the second the weather warms up, the Ottawa Humane Society has an influx of seriously hurt cats who’ve fallen from open windows or a balcony. It’s called High-Rise Syndrome — a potentially deadly but common annual happenstance. There are two such cats at the OHS right now — Chico the tabby, who has been on strict cage rest with a broken pelvis since March 29, and Ti-Gars the Himalayan, who arrived June 3 suffering from a fractured hip. In separate incidents, both fell from third-floor balconies, suffered painful injuries, and face long recoveries. It is a myth that cats always land on their feet. Cats perch in dangerous, high places. Many guardians believe their cats will not fall. But they do fall. Sometimes a cat that has been watching a bird will become so focused, she may step out into thin air. Never let a cat outside unsupervised, Roney said. Securely screen or close windows, he said. Never assume that your cat has been killed, even if you look down and see her lying lifeless. Do not give up looking should your cat disappear after a fall. It is not uncommon for cats to hide in bushes or creep into buildings if the fall has upset or frightened them. June 7, 2017 – The Ottawa Humane Society is asking our community to boycott this Friday’s bull riding event at Lansdowne to send organizers the message that it’s inhumane and has no place in our city. The Professional Bull Riders (PBR) Monster Energy Tour will be rolling into Ottawa’s TD Place June 9 for their bull riding extravaganza. Promoters are calling it “Man vs. Beast,” but it’s really an animal cruelty showcase. The OHS opposes the use of animals in entertainment acts causing physical or psychological harm. This includes bull riding. “These practices are abusive, cruel and stressful and have no place in our community,” Roney said. May 18, 2017 – Stumbling upon a baby animal that needs help usually brings out the maternal instincts in all of us. But spotting a baby animal by himself doesn’t necessarily mean he’s an orphan. Many wildlife parents leave their young alone during the day, sometimes for long periods. The mother is usually nearby and quite conscious of her young. Also, keep in mind that despite their small size, many young animals are actually independent enough to fend for themselves. Wildlife rehab centres in Ottawa are filling up with animals that wouldn’t have needed the service had they been left alone. So how can you tell if an animal needs your help or should be left alone? Please call the Ottawa Humane Society at 613-725-3166, ext. 221, or visit www.ottawahumane.ca/juvenile-or-baby-wildlife/ for information on what to do if you find a baby animal. You may also call the Rideau Valley Wildlife Sanctuary at 613-258-9480 for help. May 2, 2017 – If your pet goes missing, what are the chances it will find its way home? The Ottawa Humane Society is urging pet owners to take precautions to ensure that if their dog or cat becomes lost, it has the best possible chance of a safe return — by implanting a grain-sized microchip offering permanent, life-long identification. The OHS is holding its fifth microchip clinic of 2017 on Sunday, May 7 at its 245 West Hunt Club Rd. shelter. When: Sunday, May 7, from 9 a.m. to noon. April 6, 2017 – There are no egg-scuses this year for missing A Hoppy Easter at the Ottawa Humane Society! Hip hop your way to the OHS for some free family fun on Sunday, April 9, from 11 a.m. to 2:30 p.m.
April 5, 2017 – If your pet goes missing, what are the chances it will find its way home? The Ottawa Humane Society is urging pet owners to take precautions to ensure that if their dog or cat becomes lost, it has the best possible chance of a safe return — by implanting a grain-sized microchip offering permanent, life-long identification. The OHS is holding its fourth microchip clinic of 2017 on Sunday, April 9 at its 245 West Hunt Club Rd. shelter. When: Sunday, April 9, from 9 a.m. to noon. March 13, 2017 – The Ottawa Humane Society is asking people to be on the lookout for lost, scared pets after a fire tore through a row-house complex Sunday afternoon near Baseline and Merivale Roads. Two displaced tenants have already contacted the OHS for help finding four missing cats, filling out reports in an effort to be reunited with their pets. Staff are anticipating many more such reports, said Sarah Oswald, OHS manager of admissions and rehoming. “If you find a stray animal in that neighbourhood, please bring the animal to the OHS at 245 West Hunt Club Rd. We have families out there who have been doubly devastated, first losing everything in a fire and now missing a beloved pet,” Oswald said. Lost pets will have safe and warm shelter at the OHS until they’re reunited with their families, she said. “And, if you’re missing your pet, please contact us to report it,” Oswald said. To report a lost or found pet, please call 613-725-9998 or visit www.ottawahumane.ca/services/lost-and-found to make a report anytime. Please visit the OHS website at www.ottawahumane.ca for directions and business hours. March 7, 2017 – If your pet goes missing, what are the chances it will find its way home? The Ottawa Humane Society is urging pet owners to take precautions to ensure that if their dog or cat becomes lost, it has the best possible chance of a safe return — by implanting a grain-sized microchip offering permanent, life-long identification. The OHS is holding its third microchip clinic of 2017 on Sunday, March 12 at its 245 West Hunt Club Rd. shelter. When: Sunday, March 12, from 9 a.m. to noon. Feb. 7, 2017 – If your pet goes missing, what are the chances it will find its way home? The Ottawa Humane Society is urging pet owners to take precautions to ensure that if their dog or cat becomes lost, it has the best possible chance of a safe return — by implanting a grain-sized microchip offering permanent, life-long identification. The OHS is holding its second microchip clinic of 2017 on Sunday, Feb. 12 at its 245 West Hunt Club Rd. shelter. When: Sunday, Feb. 12, from 9 a.m. to noon. Jan. 13, 2017 – The extreme cold forecast for the city tonight means pets left outside too long risk frostbite and even death without shelter from the frigid weather. Jan. 3, 2017 – If your pet goes missing, what are the chances it will find its way home? The Ottawa Humane Society is urging pet owners to take precautions to ensure that if their dog or cat becomes lost, it has the best possible chance of a safe return — by implanting a grain-sized microchip offering permanent, life-long identification. The OHS is holding its first microchip clinic of 2017 on Sunday, Jan. 8 at its 245 West Hunt Club Rd. shelter. When: Sunday, Jan. 8, from noon to 3 p.m.
Where: Ottawa Humane Society, 245 West Hunt Club Rd., between Prince of Wales Drive and Merivale Road. For more information, visit www.ottawahumane.ca.